London Lights Grenfell Tower Green A Year After Deadly Fire Seventy-two lives were lost in the fire. The incident has come to symbolize poor living conditions in public housing and what is perceived as a slow and distant government response. 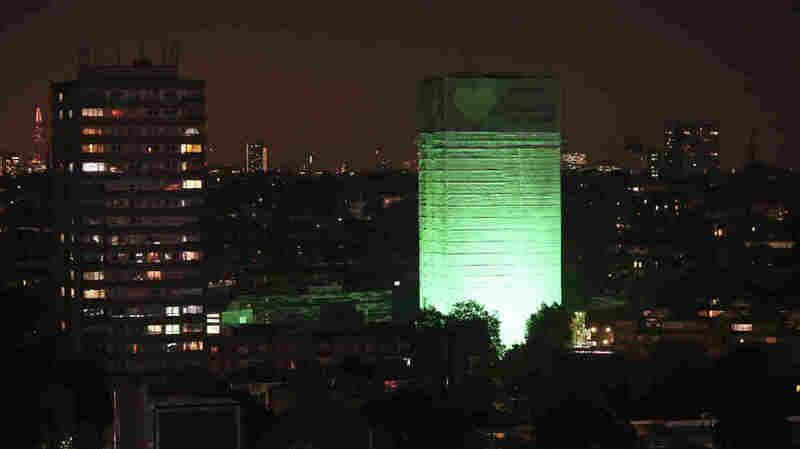 Grenfell Tower in west London is illuminated in green to mark a year since the devastating fire claimed 72 lives. The blackened shell of Grenfell Tower was lit in green Thursday to mark a year since a fire engulfed the social housing building and killed 72 people. The fire has come to symbolize poor living conditions in public housing and what is perceived as a slow and distant government response. The green lights at Grenfell and other London landmarks turned on at 12:54 a.m., the moment last year when the first emergency call was made. Prime Minister Theresa May gave an anniversary interview to Grenfell Speaks, a social media group devoted to the tragedy. In the interview published Wednesday, she acknowledged that on the day of the fire, she had only met with officials. "I didn't of course on that first visit meet members of the community or survivors, and I'm sorry for not having met them yet. I regret that because I think people perhaps felt that they wanted those of us in power, to know that we had understood and recognized what happened." A green heart has come to symbolize the Grenfell tragedy, according to an activist who spoke with USA Today. Toby Laurent Belson of Green for Grenfell tells the newspaper that green denotes healing and that in the ancient Anglo Saxon language, Grenfell means "green field." A moment of silence will be observed nationally at midday local time. "People were waving flags, whatever they had, waving, trying to get people's attention, yelling, asking for help, screaming. It was horrendous." Residents of the tower had complained about fire safety at the public housing building in the months before the disaster. The building was wrapped in siding that had a flammable polyethylene core rather than a more fire-resistant alternative, Frank reported. The fire triggered a review of building materials in other public housing high-rises across the United Kingdom. For those who survived the fire, starting over has been a challenge because of delays in finding replacement housing. After the fire, Prime Minister May promised the survivors would be rehoused within three weeks. The BBC reports that only 83 households — fewer than half of those evacuated — have been moved to permanent housing, according to the Kensington and Chelsea Council. The rest of the survivors are still in temporary homes, including hotels or living with friends and family. An inquiry into the fire began hearing evidence this month, according to the Guardian. It paused its work to allow participants to join in the commemorative events. The siding that was used on Grenfell is not allowed on the exterior of tall buildings across most of the United States; however, NPR's Jeff Brady reported that Minnesota, Indiana, Massachusetts and Washington, D.C. have exempted some siding with combustible materials from a rigorous fire safety test.